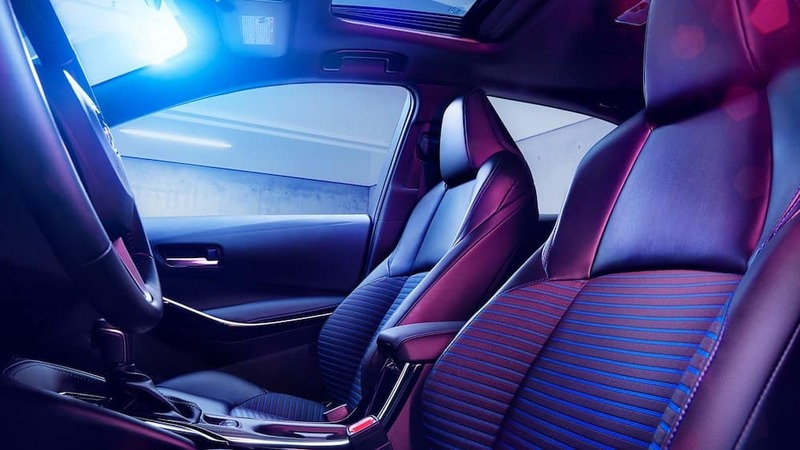 The 2020 Toyota Corolla interior is sportier, simpler, and better equipped than ever before! Although it offers more entertainment and technology than ever, its cleverly-designed interfaces and high-end finishing touches allow it to supply tons of standard features without crowding or distracting passengers. Take a look inside before you schedule your test drive near Palm Beach County or West Palm Beach. In the Corolla cabin, you’ll be able to enjoy your music with a standard 6-speaker audio system or an available 9-speaker JBL Audio system with Clari-Fi. The system you receive will depend on which trim level and Entune package you select. Bluetooth and USB connections are standard, so it’s easy to plug in with your favorite tunes. With standard Entune 3.0 technology, you’ll enjoy Apple CarPlay®, Amazon Alexa compatibility, Wi-Fi Connect, and a whole lot more. The standard configuration features a 7-inch touchscreen, while upgraded models offer an 8-inch display. Manage features and view important vehicle information using the multi-information display (MID) located on the dashboard. A 4.2-inch display is standard, but an even crisper 7-inch display has been included in the more advanced grades. The 2020 Corolla follows its predecessors by offering seating for five in both its sedan and hatchback configurations. This year’s model will feature new two-tone interior contrast color options, as well as newly available synthetic seating options like SofTex. In addition, subtle changes have been made to the dashboard and interior layout, so you and your passengers can enjoy better visibility and more second-row legroom. We’d be remiss if we didn’t also note that the 2020 Toyota Corolla interior is even quieter this time around. The new TNGA powertrain offers a smoother, more refined, and more efficient ride, all while producing less noise! Since the new model also features an improved distribution of materials that absorb sound, you’ll never be unable to enjoy pleasant conversation on the road. Even at highway speeds, the Corolla interior is an oasis. Stay Up to Date with the 2020 Corolla News! Earl Stewart Toyota of North Palm Beach is keeping up with all the latest news surrounding the 2020 Toyota Corolla, and we’ll pass off everything we know to our neighbors in the Palm Beach County area. Don’t want to wait to find out what sets the Toyota Corolla apart? Stop into Earl Stewart Toyota of North Palm Beach to take any Toyota Corolla for sale on a test drive, or compare the 2019 Corolla vs. 2019 Nissan Sentra. If you have more questions on the 2020 Corolla price, contact Earl Stewart Toyota of North Palm Beach online today!